McCrometer’s V-Cone® flow meter is an innovative system that takes differential pressure flow measurement to another level. Designed for mild to harsh operating environments, and for a wide variety of fluids, this advanced flow meter consistently outperforms traditional DP devices and other flow technologies. The V-Cone flow meter offers better accuracy and repeatability, wider rangeability, installation flexibility and reduced maintenance. The key benefit to the V-Cone flow meter’s unique design is its ability to provide repeatable accuracy of up to ±0.5% of rate under even the most difficult flow conditions. 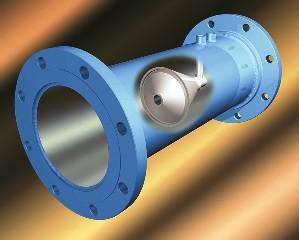 The V-Cone flow meter has been proven to be accurate over a wide range, from very low to extremely high Reynolds numbers. Whether measuring swirling fluids or low pressure flows, the V-Cone flow meter delivers the accuracy and reliability other devices only achieve under laboratory conditions. The V-Cone flow meter also has low headloss when compared to other dP technologies. Acts As Own Flow Conditioner – The V-Cone flow meter’s enhanced performance is due to the shape and position of the cone in relation to the measurement ports. This allows the V-Cone flow meter to act as its own flow conditioner by disrupting all centralised flow disturbances. This fully mixed and conditioned flow results in a low amplitude, high frequency signal with little “signal noise.” Readings are always precise and reliable, including low pressure flow situations.